My seaside foraging excursions have been marked by a failure to find laver. Even on the coastal foraging course, Jade couldn't relocate the laver she'd spotted a few days earlier. However, she did bring some she'd prepared earlier, so we could try some, and discussed methods of cooking it. The traditional Welsh way is to make laverbread which takes many hours of boiling, but Jade, like me, doesn't like the idea of what John Wright calls, metaphorically speaking, beating it into submission. Far, far away in Japan, they have a very different way of treating it, as this is the basis for nori, that's wrapped around rice and fish in sushi dishes. Jade herself simply toasts the laver lightly (after careful washing and drying). Consulting John's River Cottage Handbook to the Edible Seashore, I learned that the seaweeds known as laver are in fact several species of the genus Porphyra, though all edible and tasty. Some of these grow all year round, some in the summer and some in the winter, so there's a chance of finding it at any time of year. On the other hand, they can disappear quite suddenly, which explains why I didn't find any even when I went to a place that someone else had seen it quite recently. Last Saturday, almost on impulse, I went to the beach at the low spring tide, just after the full moon (OK, maybe not that impulsive, as I had looked up the tides beforehand). I'd more or less given up looking for laver, but there it was, all over the rocks, looking, as I'd been told it would, like black plastic bags. I'm afraid I didn't have a camera with me, so you'll have to make do with the photos I took when I got it home. More laver, on the drying rack, though it's not drying very well at this time of year. Cooked laver with eggy bread things, and a dollop of knotweed chutney on the side. ... and it was delicious! John Wright describes laver as, frankly, a food best learned before the age of five, but I disagree. I first met it in the form of nori when I worked in a university that had a lot of Japanese students. Alongside the sandwiches and cornflakes with little portions of milk, the student shop sold sushi. I love it! I've never before felt the urge to make my own sushi, but now I've picked my own laver, I'm tempted to try... or at least a variation on the theme. In the meantime I'd better make sure that harvest is dried properly before the mould gets to it. Foraged food challenge summary page here. Like sloes and parsnips, rosehips are recommended to be picked after the first frost. Well, I don't think we've had a frost here yet but I've been eating parsnips for several weeks now and my sloe wine is well underway. As I understand it, the frost itself doesn't make a difference, it's just an indicator of time of year. Some people say otherwise, though, so I'd have to do some experiments to be sure on this. I went put looking for elderberries the other day (and found some!) and on the way I spotted some cheery red rosehips in the hedge. Rose hips (Rosa canina, probably) not in the hedge. These were in my garden a couple of years ago, and in rather worse condition than the ones in the hedge the other day. They certainly looked ripe and closer inspection revealed several to be already going over. I've missed out on rosehips before (the ones in the photo - and that was only September) by waiting for the frost so I wasn't going to leave these to spoil; I picked as many as I could reach. My plan was to preserve them as fruit leather, combined with another fruit. 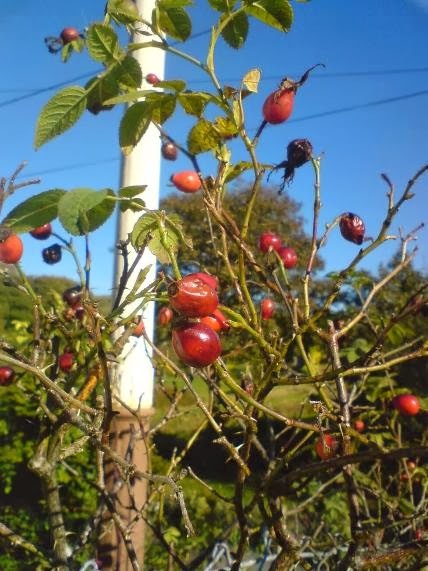 On my post on crab apples, John suggested making fruit leather from those. These have a number of advantages over the haws I've used before, being less fiddly, more flavourful, and lying about on the grass just behind my house. The seemed good enough reasons to try crab apples with my rosehips. Having gathered my hips, I then needed to de-seed them. Rosehips are packed full of seeds and fine, irritating hairs, neither of which I wanted in my fruit leather. The only effective way I've found of de-seeding rosehips involves a small knife and a lot of patience. Whilst engaged in this task, I pondered crab apples. The jellies I'd made with them a few weeks ago hold their shape very well when cut - I wondered if it might be possible to make something like a jelly sweet (candy), halfway between a spreadable jelly and a chewy fruit leather. If I included the fruit pulp as well as the juice, I guess that would make it a fruit 'cheese'. I stewed my 4 oz rosehips (weighed after de-seeding) with 6 oz crab apples (including seeds) and as little water as I could get away with. When they were disintegrating soft I pushed the pulp through a sieve, added sugar to taste - about 6 oz - then about the same again, and boiled until it passed the wrinkle test, and then some. I carefully poured the thick mixture into little chocolate moulds and waited. When it was cool I turned one out and it held its shape encouragingly... until I poked it. Hmm, not enough pectin. I have a stash of lemon pips kept for occasions just such as this. I soaked some (probably not for long enough) and boiled them with a few more crab apples, pushed through a sieve, mixed in the rest of the not-quite-set pulp, melted and boiled that and tried again. Next morning... same result. I though crab apples were supposed to be high in pectin? I had noticed that these windfalls looked considerably riper than the ones I was using a few weeks ago. I guess that must be the difference. Oh well, revert to Plan A.
I spread the mixture out on baking trays and put them in the oven on its lowest possible setting to dry. Whilst I had the oven in drying mode, I went out in search of mushrooms to go in at the same time. I found three blusher mushrooms, so they're now sliced, dried and stored in a jar. Back to the fruit leather... the finished sheets were stickier than anything I've ever created in my kitchen before. I folded them and put them back in the oven for a while on the drying rack, but it didn't reduce the stickiness much. The sheet on the right was on the top shelf in the oven, which is why it's darker. It was also more brittle. I hadn't tried to prise it off the drying rack at this stage, but when I did, it broke in many interesting ways. If I cut these sheets and stacked them I'd end up with a solid block. If I wrapped each piece in greaseproof paper I could spend an afternoon trying to unwrap one piece. What to do? They certainly need wrapping, but minimising surface area would be a good idea. How about folding strips up into little blocks and treating them as toffees? They're too sweet for fruit leather anyway. This is what I did (with the softer sheet, anyway. The brittle sheet took more of a 3D jigsaw puzzle approach), taking the added precaution of rubbing a little sunflower oil onto the paper first. Oh dear, some of the sweets don't fit in the jar. No, Pebble, those are NOT yours! So I was aiming for fruit leather and I ended up with fruit toffees. I've had worse culinary disasters. Of course, it remains to be seen whether it will be possible to unwrap these in a few months time. Edit: I've never bothered making rosehip syrup before because I wasn't sure what to do with it. The other day (about the 10th Nov) I decided I'd like to try some with pancakes, so picked some hips from the garden and made a small batch of syrup. As well as pouring on pancakes, I had enough to try it as a cordial, i.e. mix it with water to make a drink. This is delicious! I can't believe it's taken me so long to try this - I've been picking rosehips for years. It's also much easier than any other way I've used them, as you don't need to de-seed the hips. Most recipes call for mincing the fruit first, but I didn't even bother with that. I just stewed the fruit with a little water until it was soft (though many of the skins were still intact, holding the pulp and seeds inside), lined a basin with a straining-cloth, dumped the fruit and water in and mashed until all the hips were squashed, then tied and hung up to strain, finishing with a good squeeze when it was cool. In fact, the hanging-up stage could be omitted if you're going to squeeze it anyway - just leave it to cool then squeeze. The final step was adding sugar to taste. It was quite a thin syrup compared with other cordials I've made, but not lacking in flavour. I will definitely be making this again! Hazelnuts - there are still a few! After a couple of disappointing years, I was determined to make a good go of growing tomatoes before giving up on them as needing more sunshine than we're ever likely to see in this part of Wales. As luck would have it, we had the best summer anyone can remember, so I had the best chance possible of getting a good crop. I started my seeds off early on the home-made heated propagator. The seedlings came on nicely and I pricked them out into small pots of richer compost. ... but even so, I felt I was doing reasonably well at tending to their needs. After that I fed them weekly and carefully pinched out side shoots (OK I may have missed a few, but I got most of them) and my tomatoes grew well. On the first weekend in August, we attended a local agricultural and horticultural show. There, I saw fresh, ripe tomatoes. But how? Though my plants were growing well, they'd only just started flowering. I couldn't see how I could possibly get fruit off them by the end of July. I pondered this a while and concluded that the secret must be the variety. I hadn't given much thought to this beyond choosing varieties that I wanted to eat (and by the way, seeds saved from Roma tomatoes do NOT come true) or accepting generous gifts from those with spare seeds. A quick perusal of the Real Seed Catalogue reinforced my theory, as they specialise in varieties with short growing seasons, for precisely that reason. I know where I'll be buying seeds from next year! In the meantime, all is not lost. My plants grew large and set quite a lot of fruit, and would have given me more had the season been longer. As the weather got cooler I kept the door closed for more of the time and inevitably mould took hold (my friend Gill tells me this is botrytis and can be cut out if caught early enough). Fearful of the whole crop getting infected, I decided to harvest it all at once. ... though most were still green, but I'd read that there comes a point when the fruit is sealed off from the plant and will continue to ripen whether attached or not. What they need is warmth. I sorted my tomatoes into two baskets - at least a bit orange, which went to the kitchen for using soon, and definitely green, which went into the spare room out of the way. They've since been brought into the sitting room where it's warmer, though Pebble did object that they were on her chair. Sure enough, the green tomatoes have been ripening and taste better than the crop I grew in my first year. Gill ripened hers indoors last year very successfully and predicts that we'll be eating home-grown tomatoes at Christmas, though we both agree that we'd rather have them in the summer. Japanese knotweed is a highly invasive plant that comes up in early May, or thereabouts. A piece of rhizome the size of your fingernail can grow a new plant in just ten days and they're capable of growing through concrete. It's hardly surprising, then, that it's an offence in the UK (section 14(2) of the Wildlife and Countryside Act 1981) to "plant or otherwise cause to grow in the wild" Japanese knotweed (amongst others). Bearing in mind how easy it is to start a new plant, avoiding breaking this law requires some care. Put simply, any piece ypu cut off a plant must be destroyed carefully**. I choose eating and burning as two effective methods of destruction. Whatever you do, do NOT put offcuts on a compost heap. When such an invasive plant turns out to be edible, I feel almost duty bound to eat it. That said, it took me a while to find some that I could harvest. The photo above was taken in my neighbour's garden and she wanted it left to grow leaves so she could apply glyphposate to them. I don't generally hold with using weedkiller but I have to concede that if you're going to make an exception for one plant, this is the one to make it for. By the time I found another patch, about a week later, the shoots were no longer quite so tender. Nonetheless, I took the lot - a carrier bag full. The taste is reported to be just like rhubarb and as I couldn't see myself eating that much rhubarb crumble, I thought I'd have a go at chutney. I'd never made chutney before, but it's basically a mix of fruit and/or veg boiled up in vinegar and sugar - how hard can it be? I started by chopping and stewing the knotweed - it was about three litres, chopped - with a pint of vinegar, lots of garlic (it was getting on a bit), a piece of fresh root ginger, and some more spices - cinnamon, cloves and juniper - tied in muslin. I then looked around the kitchen for other things I could throw in. One small onion... an apple that had been in the fruit bowl too long... a few ounces of muscovado sugar... a couple of half-jars of jam that just weren't getting eaten - rhubarb and ginger and apple and ginger (I prefer ginger in chutney than in jam) and a little 'Victorian chutney' that had also been lurking in the back of the fridge too long. I don't even know why it was in the fridge - it shouldn't need it. It was too sweet at that point, so I looked for something to balance that, and found half a head of iceberg lettuce in the fridge. It needed using up anyway, so that went in. Towards the end of cooking I decided that it needed more salt and that it was a very unappetising shade of light brown. I solved both of these with the addition of the remains of a jar of Marmite (a largeish tablespoonful). Towards the end of cooking, the mixture stuck and burnt a bit. I stirred that in, which darkened it, so the marmite probably wasn't entirely necessary. In total, I got eight smallish jars of chutney out of all this. It's not the best chutney I've ever tasted, but it's certainly the sort of chutney flavour I was after and it's a lot better than the 'Victorian chutney' that had been lurking at the back of the fridge. I've been using it for all the usual things I use chutney for - eating with cheese and with plain things such as potato cakes and fritters, and stirring into sauces. It's pretty good. The only downside is that it does have some rather tough fibrous bits in, due to my not catching it early enough. I don't suppose I'll need any more chutney for a few years yet, but I may think of another use for it next year. I might try making cordial, in which case the tough fibrous bits are less important, as I'd strain them out anyway. * I was intrigued by this Latin name, so looked it up. Indeed, both the fallopian tubes and this genus of plants are named after the same person, the sixteenth century Italian anatomist, also professor of botany, Gabriele Falloppio. ** If we're being strictly legal about this, Japanese Knotweed is classified as controlled waste and therefore should only be disposed of at a licensed landfill site. I'm not quite sure what they do with it there, but I consider burning it to be more in keeping with the spirit of the law than any kind of landfill. There's a rowan tree in my garden that has very pretty berries. We can see them from the bedroom window. Though pretty, these berries are not easy to pick, as the tree is tall and growing on a steep slope. Luckily, there are plenty of others around, so I don't have to go far to find one that has more accessible berries. These are not the kind of berries you'd want to eat straight from the tree. Although edible (apparently there's a small quantity of some toxin, but it's destroyed by cooking), they're bitter, but they do have an interesting flavour, so it's worth doing something with them. Last year, my friend Gill introduced me to the idea of crab apple and rowan jelly. I tried making some then and was very impressed with it, so that went firmly on the list of things to make again. This year I duly made another batch, and the result is just as good. I put the berries in a bucket, poured boiling water over them, mashed them up with a potato masher, added the sugar and lemon juice then filled up with cold water to about a gallon and finally added the yeast. I then left for a few days (I can't remember exactly, probably four days) before straining the liquid off the fruit and into a demijohn. I'll leave that for about a year, by which time it should have long since stopped fermenting and cleared, then siphon into bottles. This is my standard method for making wine, varying only how long I leave it to mature. I seek advice on how long wines need before they're drinkable - at about a year, rowan is one of the longer ones. By contrast, blackberry wine is reckoned to be ready, by Christmas . Comments on the flavour of rowan wine vary from, An acquired taste, to, Like dry sherry. Well, I quite like sherry, but even if it's not much like that, I think I should make an effort to acquire the taste just for the sake of the colour!